Homeowners today seek to beautify their home in ways that are also energy-conscious, so purchasing insulated doors makes good sense. Tax credits may be available for products that are energy-efficient, and you may earn higher credits for purchases like insulated doors. In addition, insulated doors can be every bit as beautiful in your entryway as most any other type of door. There is more emphasis on energy-efficient doors today, and this factor has made the biggest jump in importance in what door consumers choose today. Even without tax breaks, insulated doors will save you money on heating and cooling your home. Many brand name door manufacturers have doors devoted to saving money and improving the look of your home. Tax credits have specific requirements, so you should be aware, as a buyer, of the eligibility of the insulated door you purchase. Efficiency isn’t the only reason to choose insulated doors. Insulated glass is being used for some beautiful doors that are also energy-efficient. Styles of glass are driven by the region you live in. 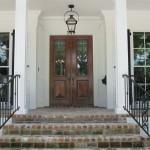 Glass areas in doors are becoming larger, and decorative glass is still in use today. Insulated doors effectively use glass to bring more natural light into your home. As a consumer, you have more choices today than you have ever had before. Low-e glass and glass coating technology advances give you insulated doors that are most effective in making your home energy-efficient. Solid core door construction gives you good insulation and sound-deadening benefits that homeowners want. When you are door shopping, you will want to look for a sensible choice that also adds beauty to your home. This allows you to choose the best value for your money. This doesn’t mean buying cheap doors; it means getting the most for your money. Value does not include only the ability to be energy-efficient. The best doors are also good looking and durable. People today are partial to green building processes, too. You will want a door that will look good 10 years down the road, not just today. Recycled content is important in “green” insulated doors. A turn away from using formaldehyde for doors makes them greener and also safer for you and your family. The lack of this chemical compound in doors gives you improved air quality in your home. If you are remodeling your home, or choosing a door for a new home, you will find that there are many options from which to make your choice. There are key differences in replacement doors, since they are made to securely fit into existing openings. Some insulated doors can be trimmed to fit without affected the core of insulation. A new entry door is something that will make a statement about your home. These doors do not need to be limited to standard sizes. They can fit in different openings and still keep their insulating properties. Composite entry systems are used for homes and light commercial buildings. These insulated doors are waterproof and fire-rated. There is continuing development in identifying the markets in which to sell quality, insulated doors. Green manufacturing is also used on interior doors, even though energy efficiency isn’t as important on inside doors. “Green” doors offer you materials that are sustainable, along with recycled content used in construction. Green insulated doors also offer low-VOC adhesives and primers and low emissions of formaldehyde. This type of door is gaining traction among consumers who are looking for the best designs built with sustainable, strong materials.